Today's camper is a diamant in the rough still. But so many vintage campers are when they first get discovered and eventually will be lovingly restored. This is the case here with this 1963 Mobil Scout 'Mabel' as well. Wow, if she is from 1963, we don't know how long she has been forgotten sitting in the woods! Since I have been bitten by the camper-bug, wherever I travel my eyes wander to the woods, too, to any field, behind houses, yards and so on to scout for that vintage camper gem. My friends make fun of me now, but really, after a while I hear them comment on any vintage camper they see! In our neck of the woods, there are still so many around, just waiting to be picked up! If you are looking for a project this winter and live in our area, just check the Kijiji or Craigslist listings or keep your eyes peeled when you travel. (Of course, if you are the driver, keep your eyes peeled on the street, haha). I want to thank all of you who have submitted photos this month and keep journeying with me, it has been a blast and I learned a lot! 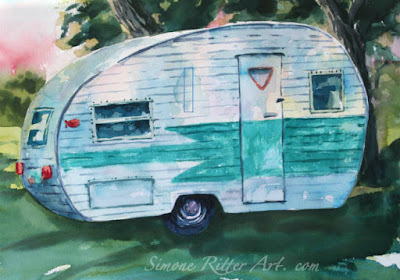 There is only one more week 'til end of the month, so I might not be able to paint every camper submitted. 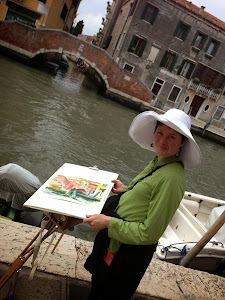 Or I might have to keep painting into October... what is your take on this? Enough campers? Time to move on? Or keep glamping away? Please let me know! I'd like to hear from you!